Flowering dogwoods are some of the most widely planted ornamental trees in Georgia. They are a Georgia native tree and can be found growing throughout the state. AND NO, they are not the officially designated State Tree (the Southern Live Oak is the official tree for the Peach State). 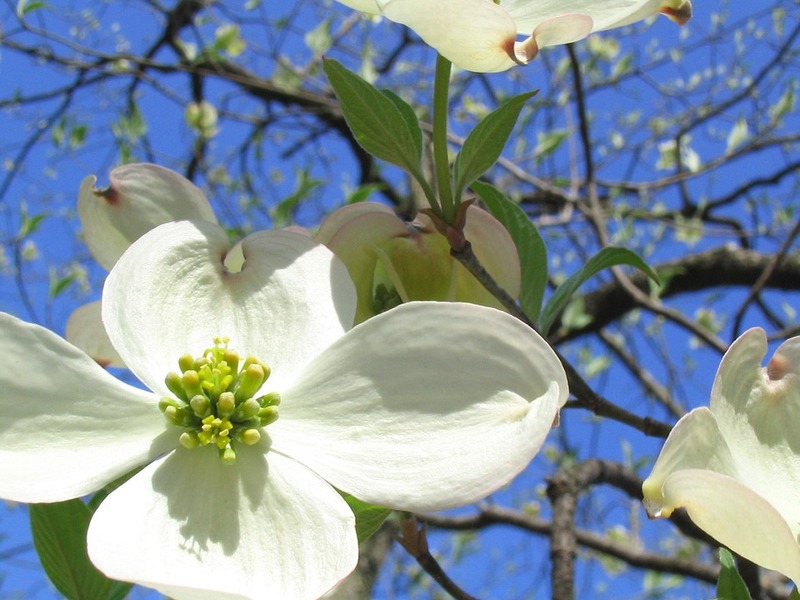 Dogwoods are not difficult trees to grow, but success does depend on healthy transplants, like the trees sold at the SGG Spring Plant Sale at the end of April. SGG typically has a wonderful selection of unusual Dogwood varieties for sale at this event. The most popular flowering dogwood planted in Georgia is the white-bracted native form. These are typically grown from seed throughout the State. For an up-close view of the bracted native form, just walk around Smith-Gilbert Gardens in early April. Dogwoods grow naturally in moist, fertile soils high in organic matter, but they are adaptable to many soil types. Dogwoods cannot tolerate poorly drained soils and hate “wet feet”. In the wild, dogwoods are commonly found as an understory tree under hardwoods and pines. For best results, plant in association with larger trees to provide moderate shade. Growth problems are associated with hot, dry conditions, while too much shade can cause poor flowering…(for an interesting article on distressed Dogwoods in Kennesaw, please read the May 2013 SGG Garden Blog by Dr. Bob Smith (a true plant enthusiast and Kennesaw philanthropist and the article is kindly acknowledged and reprinted through the Franklin Press). What is called the “flower” is actually bracts, which are modified leaves that turn color. The true flower is in the center of the bracts. The age of flower production can vary on seed-grown dogwoods. Fast growing dogwoods may delay production. As is noted on the Pikes nursery website, Dogwood Trees that produce an abundance of flowers and follow up with a heavy berry crop will likely produce a small number of flowers the next year. What is called the “flower” is actually bracts, which are modified leaves that turn color. The true flower is in the center of the bracts. The Dogwood is a deciduous tree. Some species are classified as shrubs, while some are evergreen trees. Below is a list of some of the Dogwoods sold last fall at the SGG Fall Plant Sale. Some of the selection of plants will blow your mind when they are in bloom! 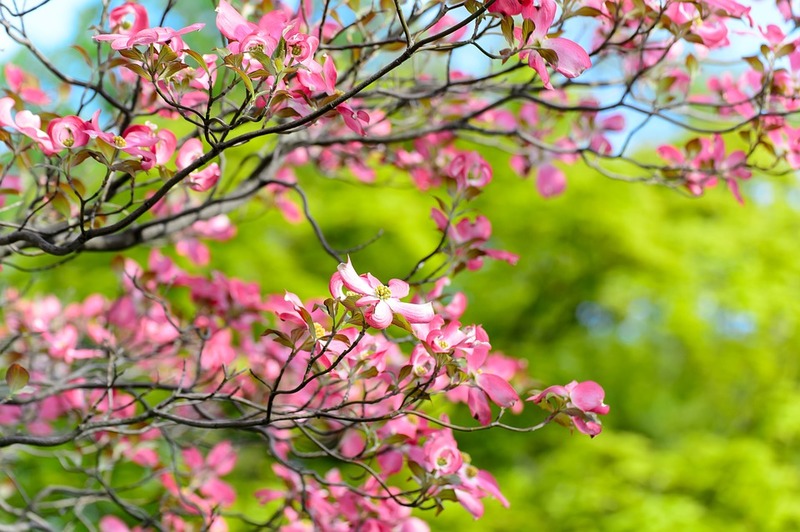 The dogwood tree belongs to the family Cornaceae, and its scientific name is Cornus florida. It is quite common in eastern North America. It is an ornamental tree and is also known as hound’s tree. The fruits are known as dogberries or hound berries. Fruits obtained from some species of dogwood are eaten, but they do not have a delicious flavor. Wood obtained from the tree is quite hard and strong, and is used to make different types of tools, such as walking canes, loom shuttles, etc. Its flowersare very attractive. 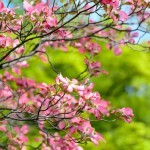 Those who are fond of flowering trees should definitely consider planting a dogwood tree in their garden. The height of the tree varies according to the cultivar. Usually it grows up to a height of 30-35 feet. In spring, the tree gets covered with clusters of cream, white, pink, or red flowers. The flowers remain for at least 2-3 weeks. It can live for up to 80 years or more. During summer, when flowering is over, the tree gets covered with attractive green foliage. In autumn, shiny red fruits attract birds towards the tree. The leaves turn red and purple in fall. The tree requires well-dug, well-drained soil. Applying mulch once every year is essential to make the soil rich in nutrients. Appearance of white flowers on the tree indicates the arrival of spring. This tree is among the first to bloom. A traditional remedy uses tea made from the bark of the tree for reducing fever. The bark has also been used to treat mange and malaria. In the Victorian Era, young men used to present dogwood flowers to unmarried women to convey affection. If the woman kept the flower, it was considered a sign of mutual interest. Women who wanted to convey indifference would return the flower. There are about 40 different types of dogwood found throughout the world. Out of these, 15 are native to North America and Canada. Guided tours for groups of 10 or more available by appointment. © 2019 Smith-Gilbert Gardens | Website by AndiSites Inc.
5-11-19...cocktails...games...prizes...silent and live auctions...Save the date and buy your tickets to the Rose Garden Gala now. Proceeds support the collections and education programs of Smith-Gilbert Gardens.